Installation photographs of the exhibition history of Chris Page. Statements are below the images from the exhibition. RECENTLY, ON A VERMONT HILLSIDE, my four-year-old grandniece plopped herself on the ground, patted the space next to her, and invited me lie down to watch the clouds. I couldn’t remember the last time I eliminated the horizon from my field of vision to focus solely on the clouds. It was magical. 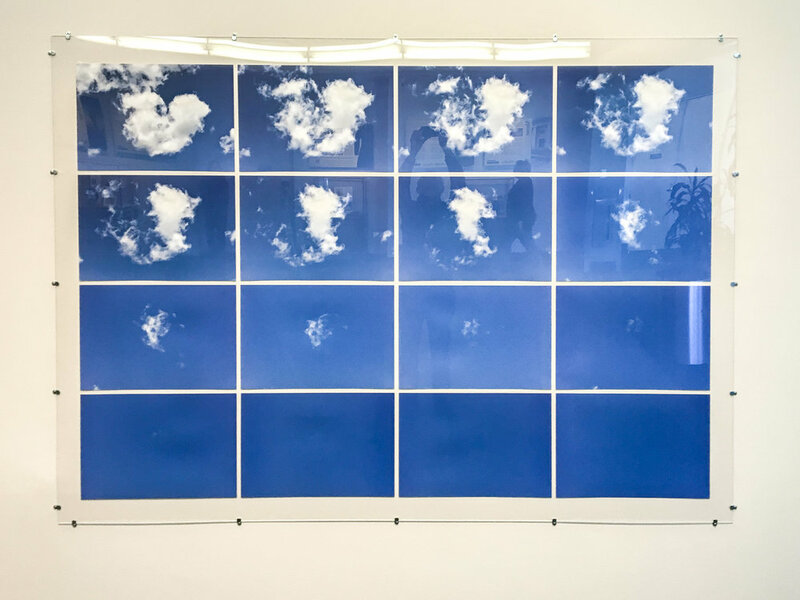 In Eyes Toward Heaven Chris Page creates an immersive installation that brings us back to the childhood act of cloud gazing. It is a space where time slows as we contemplate minute shifts in color and form. 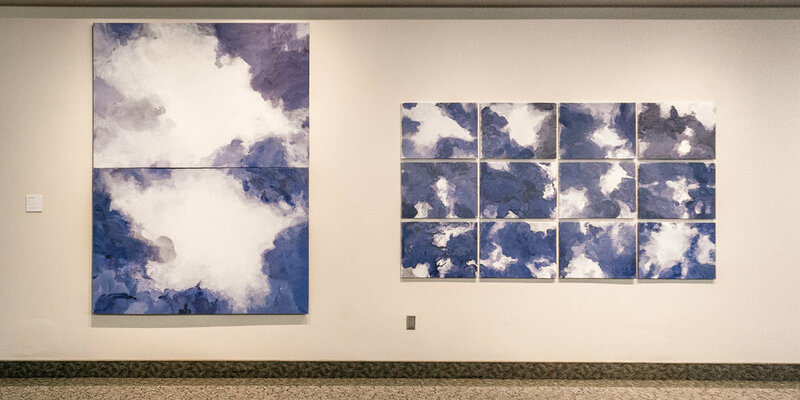 Page’s clouds possess their own internal, pictorial logic and materiality. 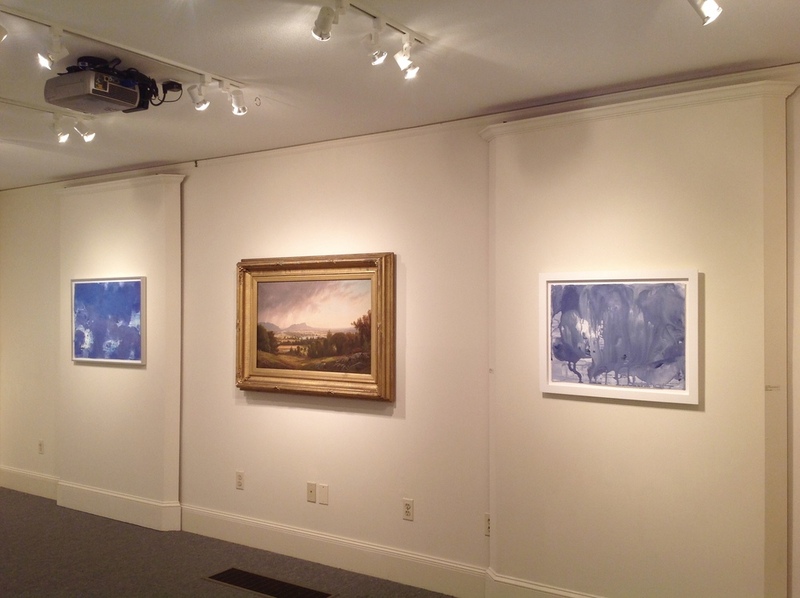 While each component painting is a beautiful abstraction, together they offer a portrait of the sky in motion. The expressive and metaphoric potential of the work is limited only—as it is when one lies on a hill gazing up—by the viewer’s imagination. 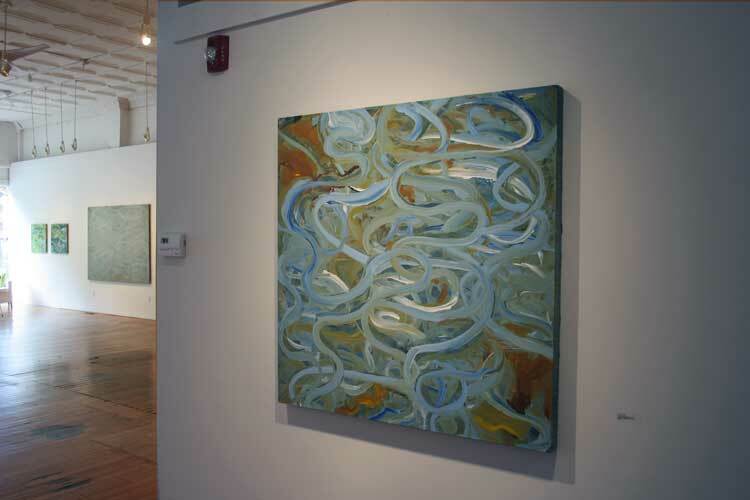 MY WORK IS BASED ON SEEING the everyday world as a door into the remarkable, where a moment opens into the timeless. 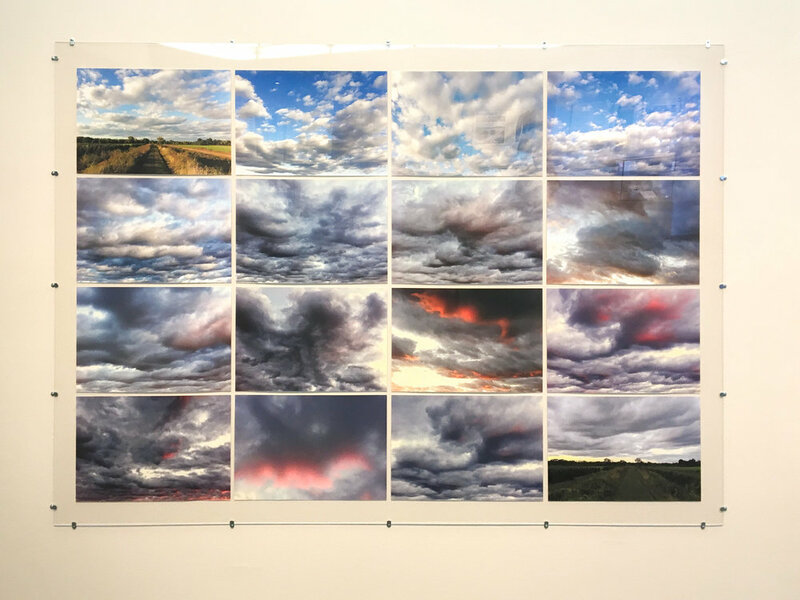 Walks in nature are integral to my art practice: traversing open spaces, feeling the quality of the air, listening to the wind and birds, and experiencing the spacious wilderness of our common ceiling. During these walks I take documentary photographs that serve as source material for my paintings. Eyes Toward Heaven reflects a walk on July 18, 2016, in the fields of the Connecticut River Valley in Hadley, Massachusetts. 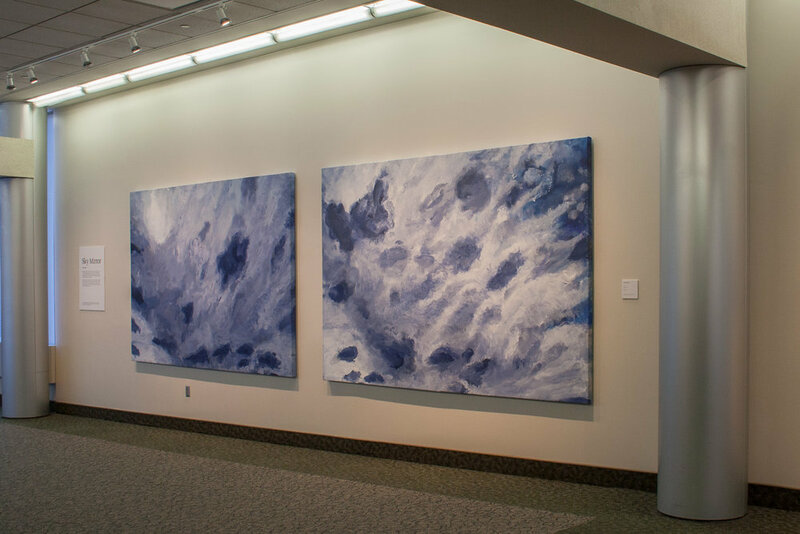 The three large- scale paintings express distinct moments during a 25-minute period of transformation in the daytime sky. In my art I strive to reflect moments of awareness by using a sequence of multiple images to awaken a sense of the sublime. Working intuitively I apply acrylic paint in a broad range of techniques, frequently repeating gestures to build up complex rhythms and spaces. Whether taking photo- graphs or painting, I enter into a state of flow aiming to capture, or express, a continuous, unfolding quality of time. Prices list with links to buy Chris Page's art.